Unarguably, the Taj Mahal is one of the most-visited ancient monuments in the world. On account of its historical significance and architectural prominence, it allures tourists from all over the world who come here to witness this incredible marvel and capture its beauty on their camera. But do you know most of us end up shooting its loveliness in a regular frame? So, why not go exploring the charm of the Taj Mahal through the viewfinder of your camera and carve out some nice unconventional snaps? If you are one aspiring photographer, you must read this article to learn about several photography tips so that you can capture the best of the Taj Mahal on your screen. Read on to know more about them. If you always look forward to framing any place differently by avoiding the regular image, then this is one tip you must keep in your mind forever - try an unconventional angle. You must have seen thousands of Taj Mahal pictures taken from an angle facing the front facade of the wonder. But did you ever try to find a different angle and then capture the beauty of the Taj Mahal? If not, then you must try this easy-to-use and practical tip. It will not only provide you with the unconventional pictures of the Taj Mahal but also help you learn about the offbeat photography. This is one thing which most of the tourists miss while on their visit to the marvellous Taj Mahal. Always remember that the beauty of any monument doesn't lie in its overall structure but in its details. So, next time you are on a trip to Agra and are looking to capture some unique shots of the Taj Mahal, maintain your focus on the details of its walls, domes and minarets. The intricate patterns and commendable designs over them certainly deserve to be framed. After all, these are the things which make Taj Mahal the wonder of the world. Those pleasing flowery patterns will certainly allure you. Did you ever try your hand at aerial photography? Now when flying drones without the permission of the Indian government is legal, you can capture the beauty of the Taj Mahal from the top of the world. It will provide you and your frames a better perspective of this wonder. Through such drone shots, you will also be able to explore the surroundings of the Taj Mahal easily. It is rightly said that the more you go up in the sky, the more beautiful the earth becomes. So, why not get yourself to Agra this season and capture the most beautiful shots of the Taj Mahal? How about getting yourself to the Taj and putting its beauty out of focus in your frame? Well, this is something not everyone tries. Therefore, if you love photography to the core and always look to experiment with your style, try this tip. It will not only bring creativity to your frame but also provide you with the experience of exploring things differently. Don't you think a shot of the entrance gate with the main structure of the Taj Mahal in the background will be commendable? Most Read: Agra Has A Red Taj Mahal! Did You Know About It? The frame of the Taj Mahal reflecting in its nearby pool is one of the common shots of this incredible wonder. Why not experiment with this frame and change the waterbody? 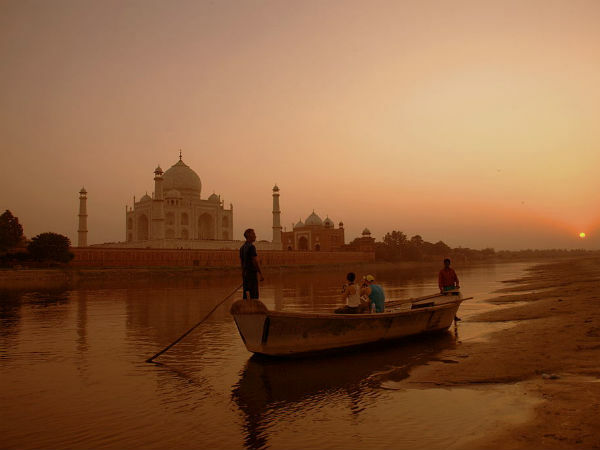 Yes, try to collect the beauty of the Yamuna river and the entire structure of the Taj Mahal in a single image. Always remember to keep a low angle while taking such shots.